Current understanding of gravity is based on Albert Einstein's general theory of relativity. Formulated in 1915, general relativity explains gravity in terms of the geometry of space and time, or spacetime. It is formulated in the language of classical physics developed by physicists such as Isaac Newton and James Clerk Maxwell. The other nongravitational forces are explained in the framework of quantum mechanics. Developed in the first half of the twentieth century by a number of different physicists, quantum mechanics provides a radically different way of describing physical phenomena based on probability. Quantum gravity is the branch of physics that seeks to describe gravity using the principles of quantum mechanics. Currently, the most popular approach to quantum gravity is string theory, which models elementary particles not as zero-dimensional points but as one-dimensional objects called strings. In the AdS/CFT correspondence, one typically considers theories of quantum gravity derived from string theory or its modern extension, M-theory. In everyday life, there are three familiar dimensions of space (up/down, left/right, and forward/backward), and there is one dimension of time. Thus, in the language of modern physics, one says that spacetime is four-dimensional. One peculiar feature of string theory and M-theory is that these theories require extra dimensions of spacetime for their mathematical consistency: in string theory spacetime is ten-dimensional, while in M-theory it is eleven-dimensional. The quantum gravity theories appearing in the AdS/CFT correspondence are typically obtained from string and M-theory by a process known as compactification. This produces a theory in which spacetime has effectively a lower number of dimensions and the extra dimensions are "curled up" into circles. A standard analogy for compactification is to consider a multidimensional object such as a garden hose. If the hose is viewed from a sufficient distance, it appears to have only one dimension, its length, but as one approaches the hose, one discovers that it contains a second dimension, its circumference. Thus, an ant crawling inside it would move in two dimensions. The application of quantum mechanics to physical objects such as the electromagnetic field, which are extended in space and time, is known as quantum field theory. In particle physics, quantum field theories form the basis for our understanding of elementary particles, which are modeled as excitations in the fundamental fields. Quantum field theories are also used throughout condensed matter physics to model particle-like objects called quasiparticles. In the AdS/CFT correspondence, one considers, in addition to a theory of quantum gravity, a certain kind of quantum field theory called a conformal field theory. This is a particularly symmetric and mathematically well behaved type of quantum field theory. Such theories are often studied in the context of string theory, where they are associated with the surface swept out by a string propagating through spacetime, and in statistical mechanics, where they model systems at a thermodynamic critical point. In the AdS/CFT correspondence, one considers string theory or M-theory on an anti-de Sitter background. This means that the geometry of spacetime is described in terms of a certain vacuum solution of Einstein's equation called anti-de Sitter space. In very elementary terms, anti-de Sitter space is a mathematical model of spacetime in which the notion of distance between points (the metric) is different from the notion of distance in ordinary Euclidean geometry. It is closely related to hyperbolic space, which can be viewed as a disk as illustrated on the right. 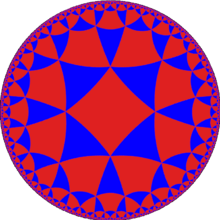 This image shows a tessellation of a disk by triangles and squares. One can define the distance between points of this disk in such a way that all the triangles and squares are the same size and the circular outer boundary is infinitely far from any point in the interior. This construction describes a hypothetical universe with only two space and one time dimension, but it can be generalized to any number of dimensions. Indeed, hyperbolic space can have more than two dimensions and one can "stack up" copies of hyperbolic space to get higher-dimensional models of anti-de Sitter space. An important feature of anti-de Sitter space is its boundary (which looks like a cylinder in the case of three-dimensional anti-de Sitter space). One property of this boundary is that, locally around any point, it looks just like Minkowski space, the model of spacetime used in nongravitational physics. One can therefore consider an auxiliary theory in which "spacetime" is given by the boundary of anti-de Sitter space. This observation is the starting point for AdS/CFT correspondence, which states that the boundary of anti-de Sitter space can be regarded as the "spacetime" for a conformal field theory. The claim is that this conformal field theory is equivalent to the gravitational theory on the bulk anti-de Sitter space in the sense that there is a "dictionary" for translating calculations in one theory into calculations in the other. Every entity in one theory has a counterpart in the other theory. For example, a single particle in the gravitational theory might correspond to some collection of particles in the boundary theory. In addition, the predictions in the two theories are quantitatively identical so that if two particles have a 40 percent chance of colliding in the gravitational theory, then the corresponding collections in the boundary theory would also have a 40 percent chance of colliding. A hologram is a two-dimensional image which stores information about all three dimensions of the object it represents. 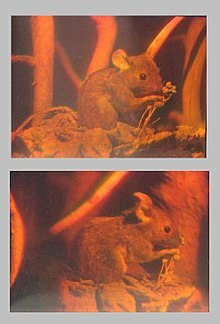 The two images here are photographs of a single hologram taken from different angles. Notice that the boundary of anti-de Sitter space has fewer dimensions than anti-de Sitter space itself. For instance, in the three-dimensional example illustrated above, the boundary is a two-dimensional surface. The AdS/CFT correspondence is often described as a "holographic duality" because this relationship between the two theories is similar to the relationship between a three-dimensional object and its image as a hologram. Although a hologram is two-dimensional, it encodes information about all three dimensions of the object it represents. In the same way, theories which are related by the AdS/CFT correspondence are conjectured to be exactly equivalent, despite living in different numbers of dimensions. The conformal field theory is like a hologram which captures information about the higher-dimensional quantum gravity theory. Following Maldacena's insight in 1997, theorists have discovered many different realizations of the AdS/CFT correspondence. These relate various conformal field theories to compactifications of string theory and M-theory in various numbers of dimensions. The theories involved are generally not viable models of the real world, but they have certain features, such as their particle content or high degree of symmetry, which make them useful for solving problems in quantum field theory and quantum gravity. factor). In the real world, spacetime is four-dimensional, at least macroscopically, so this version of the correspondence does not provide a realistic model of gravity. Likewise, the dual theory is not a viable model of any real-world system as it assumes a large amount of supersymmetry. Nevertheless, as explained below, this boundary theory shares some features in common with quantum chromodynamics, the fundamental theory of the strong force. It describes particles similar to the gluons of quantum chromodynamics together with certain fermions. As a result, it has found applications in nuclear physics, particularly in the study of the quark–gluon plasma. is equivalent to the so-called (2,0)-theory in six dimensions. In this example, the spacetime of the gravitational theory is effectively seven-dimensional. The existence of the (2,0)-theory that appears on one side of the duality is predicted by the classification of superconformal field theories. It is still poorly understood because it is a quantum mechanical theory without a classical limit. Despite the inherent difficulty in studying this theory, it is considered to be an interesting object for a variety of reasons, both physical and mathematical. is equivalent to the ABJM superconformal field theory in three dimensions. Here the gravitational theory has four noncompact dimensions, so this version of the correspondence provides a somewhat more realistic description of gravity. Interaction in the quantum world: world lines of point-like particles or a world sheet swept up by closed strings in string theory. In quantum field theory, one typically computes the probabilities of various physical events using the techniques of perturbation theory. Developed by Richard Feynman and others in the first half of the twentieth century, perturbative quantum field theory uses special diagrams called Feynman diagrams to organize computations. One imagines that these diagrams depict the paths of point-like particles and their interactions. Although this formalism is extremely useful for making predictions, these predictions are only possible when the strength of the interactions, the coupling constant, is small enough to reliably describe the theory as being close to a theory without interactions. The starting point for string theory is the idea that the point-like particles of quantum field theory can also be modeled as one-dimensional objects called strings. The interaction of strings is most straightforwardly defined by generalizing the perturbation theory used in ordinary quantum field theory. At the level of Feynman diagrams, this means replacing the one-dimensional diagram representing the path of a point particle by a two-dimensional surface representing the motion of a string. Unlike in quantum field theory, string theory does not yet have a full non-perturbative definition, so many of the theoretical questions that physicists would like to answer remain out of reach. The problem of developing a non-perturbative formulation of string theory was one of the original motivations for studying the AdS/CFT correspondence. As explained above, the correspondence provides several examples of quantum field theories which are equivalent to string theory on anti-de Sitter space. One can alternatively view this correspondence as providing a definition of string theory in the special case where the gravitational field is asymptotically anti-de Sitter (that is, when the gravitational field resembles that of anti-de Sitter space at spatial infinity). Physically interesting quantities in string theory are defined in terms of quantities in the dual quantum field theory. 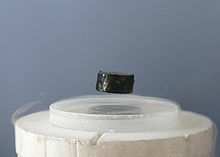 Over the decades, experimental condensed matter physicists have discovered a number of exotic states of matter, including superconductors and superfluids. These states are described using the formalism of quantum field theory, but some phenomena are difficult to explain using standard field theoretic techniques. Some condensed matter theorists including Subir Sachdev hope that the AdS/CFT correspondence will make it possible to describe these systems in the language of string theory and learn more about their behavior. As a very general problem with the AdS/CFT approach in condensed-matter theory, we can point to those telltale initials "CFT"—conformal field theory. Condensed-matter problems are, in general, neither relativistic nor conformal. Near a quantum critical point, both time and space may be scaling, but even there we still have a preferred coordinate system and, usually, a lattice. There is some evidence of other linear-T phases to the left of the strange metal about which they are welcome to speculate, but again in this case the condensed-matter problem is overdetermined by experimental facts. Gerard 't Hooft obtained results related to the AdS/CFT correspondence in the 1970s by studying analogies between string theory and nuclear physics. Stephen Hawking predicted in 1975 that black holes emit radiation due to quantum effects. In 1975, Stephen Hawking published a calculation which suggested that black holes are not completely black but emit a dim radiation due to quantum effects near the event horizon. This work extended previous results of Jacob Bekenstein who had suggested that black holes have a well defined entropy. At first, Hawking's result appeared to contradict one of the main postulates of quantum mechanics, namely the unitarity of time evolution. Intuitively, the unitarity postulate says that quantum mechanical systems do not destroy information as they evolve from one state to another. For this reason, the apparent contradiction came to be known as the black hole information paradox. Leonard Susskind made early contributions to the idea of holography in quantum gravity. Later, in 1993, Gerard 't Hooft wrote a speculative paper on quantum gravity in which he revisited Hawking's work on black hole thermodynamics, concluding that the total number of degrees of freedom in a region of spacetime surrounding a black hole is proportional to the surface area of the horizon. This idea was promoted by Leonard Susskind and is now known as the holographic principle. The holographic principle and its realization in string theory through the AdS/CFT correspondence have helped elucidate the mysteries of black holes suggested by Hawking's work and are believed to provide a resolution of the black hole information paradox. In 2004, Hawking conceded that black holes do not violate quantum mechanics, and he suggested a concrete mechanism by which they might preserve information. In late 1997, Juan Maldacena published a landmark paper that initiated the study of AdS/CFT. According to Alexander Markovich Polyakov, "[Maldacena's] work opened the flood gates." The conjecture immediately excited great interest in the string theory community and was considered in articles by Steven Gubser, Igor Klebanov and Polyakov, and by Edward Witten. These papers made Maldacena's conjecture more precise and showed that the conformal field theory appearing in the correspondence lives on the boundary of anti-de Sitter space. Juan Maldacena first proposed the AdS/CFT correspondence in late 1997. One special case of Maldacena's proposal says that N=4 super Yang–Mills theory, a gauge theory similar in some ways to quantum chromodynamics, is equivalent to string theory in five-dimensional anti-de Sitter space. This result helped clarify the earlier work of 't Hooft on the relationship between string theory and quantum chromodynamics, taking string theory back to its roots as a theory of nuclear physics. Maldacena's results also provided a concrete realization of the holographic principle with important implications for quantum gravity and black hole physics. By the year 2015, Maldacena's paper had become the most highly cited paper in high energy physics with over 10,000 citations. These subsequent articles have provided considerable evidence that the correspondence is correct, although so far it has not been rigorously proved. In 1999, after taking a job at Columbia University, nuclear physicist Đàm Thanh Sơn paid a visit to Andrei Starinets, a friend from Sơn's undergraduate days who happened to be doing a Ph.D. in string theory at New York University. Although the two men had no intention of collaborating, Sơn soon realized that the AdS/CFT calculations Starinets was doing could shed light on some aspects of the quark–gluon plasma, an exotic state of matter produced when heavy ions are collided at high energies. In collaboration with Starinets and Pavel Kovtun, Sơn was able to use the AdS/CFT correspondence to calculate a key parameter of the plasma. As Sơn later recalled, "We turned the calculation on its head to give us a prediction for the value of the shear viscosity of a plasma ... A friend of mine in nuclear physics joked that ours was the first useful paper to come out of string theory." Today physicists continue to look for applications of the AdS/CFT correspondence in quantum field theory. In addition to the applications to nuclear physics advocated by Đàm Thanh Sơn and his collaborators, condensed matter physicists such as Subir Sachdev have used string theory methods to understand some aspects of condensed matter physics. A notable result in this direction was the description, via the AdS/CFT correspondence, of the transition of a superfluid to an insulator. Another emerging subject is the fluid/gravity correspondence, which uses the AdS/CFT correspondence to translate problems in fluid dynamics into problems in general relativity. In order to better understand the quantum aspects of gravity in our four-dimensional universe, some physicists have considered a lower-dimensional mathematical model in which spacetime has only two spatial dimensions and one time dimension. In this setting, the mathematics describing the gravitational field simplifies drastically, and one can study quantum gravity using familiar methods from quantum field theory, eliminating the need for string theory or other more radical approaches to quantum gravity in four dimensions. Beginning with the work of J. D. Brown and Marc Henneaux in 1986, physicists have noticed that quantum gravity in a three-dimensional spacetime is closely related to two-dimensional conformal field theory. In 1995, Henneaux and his coworkers explored this relationship in more detail, suggesting that three-dimensional gravity in anti-de Sitter space is equivalent to the conformal field theory known as Liouville field theory. Another conjecture formulated by Edward Witten states that three-dimensional gravity in anti-de Sitter space is equivalent to a conformal field theory with monster group symmetry. These conjectures provide examples of the AdS/CFT correspondence that do not require the full apparatus of string or M-theory. Unlike our universe, which is now known to be expanding at an accelerating rate, anti-de Sitter space is neither expanding nor contracting. Instead it looks the same at all times. In more technical language, one says that anti-de Sitter space corresponds to a universe with a negative cosmological constant, whereas the real universe has a small positive cosmological constant. Although the properties of gravity at short distances should be somewhat independent of the value of the cosmological constant, it is desirable to have a version of the AdS/CFT correspondence for positive cosmological constant. In 2001, Andrew Strominger introduced a version of the duality called the dS/CFT correspondence. This duality involves a model of spacetime called de Sitter space with a positive cosmological constant. Such a duality is interesting from the point of view of cosmology since many cosmologists believe that the very early universe was close to being de Sitter space. Our universe may also resemble de Sitter space in the distant future. Although the AdS/CFT correspondence is often useful for studying the properties of black holes, most of the black holes considered in the context of AdS/CFT are physically unrealistic. Indeed, as explained above, most versions of the AdS/CFT correspondence involve higher-dimensional models of spacetime with unphysical supersymmetry. In 2009, Monica Guica, Thomas Hartman, Wei Song, and Andrew Strominger showed that the ideas of AdS/CFT could nevertheless be used to understand certain astrophysical black holes. More precisely, their results apply to black holes that are approximated by extremal Kerr black holes, which have the largest possible angular momentum compatible with a given mass. They showed that such black holes have an equivalent description in terms of conformal field theory. The Kerr/CFT correspondence was later extended to black holes with lower angular momentum. The AdS/CFT correspondence is closely related to another duality conjectured by Igor Klebanov and Alexander Markovich Polyakov in 2002. This duality states that certain "higher spin gauge theories" on anti-de Sitter space are equivalent to conformal field theories with O(N) symmetry. Here the theory in the bulk is a type of gauge theory describing particles of arbitrarily high spin. It is similar to string theory, where the excited modes of vibrating strings correspond to particles with higher spin, and it may help to better understand the string theoretic versions of AdS/CFT and possibly even prove the correspondence. In 2010, Simone Giombi and Xi Yin obtained further evidence for this duality by computing quantities called three-point functions. ^ a b "Top Cited Articles of All Time (2014 edition)". INSPIRE-HEP. Retrieved 26 December 2015. ^ A standard textbook on general relativity is Wald 1984. ^ See the subsection entitled "Examples of the correspondence". For examples which do not involve string theory or M-theory, see the section entitled "Generalizations". ^ Conformal field theories are characterized by their invariance under conformal transformations. ^ For an introduction to conformal field theory emphasizing its applications to perturbative string theory, see Volume II of Deligne et al. 1999. ^ The mathematical relationship between the interior and boundary of anti-de Sitter space is related to the ambient construction of Charles Fefferman and Robin Graham. For details see Fefferman and Graham 1985, Fefferman and Graham 2011. ^ The known realizations of AdS/CFT typically involve unphysical numbers of spacetime dimensions and unphysical supersymmetries. ^ This example is the main subject of the three pioneering articles on AdS/CFT: Maldacena 1998; Gubser, Klebanov, and Polyakov 1998; and Witten 1998. ^ See Moore 2012 and Alday, Gaiotto, and Tachikawa 2010. ^ A standard textbook introducing the formalism of Feynman diagrams is Peskin and Schroeder 1995. ^ For an accessible introduction to the black hole information paradox, and the related scientific dispute between Hawking and Leonard Susskind, see Susskind 2008. ^ For a review, see Carlip 2003. ^ According to the results of Witten 1988, three-dimensional quantum gravity can be understood by relating it to Chern–Simons theory. ^ See the subsection entitled "Black hole information paradox". ^ See the Introduction in Klebanov and Polyakov 2002. Aharony, Ofer; Bergman, Oren; Jafferis, Daniel Louis; Maldacena, Juan (2008). "N = 6 superconformal Chern-Simons-matter theories, M2-branes and their gravity duals". Journal of High Energy Physics. 2008 (10): 091. arXiv:0806.1218. Bibcode:2008JHEP...10..091A. doi:10.1088/1126-6708/2008/10/091. Anderson, Philip (2013). "Strange connections to strange metals". Physics Today. 66 (4): 9. Bibcode:2013PhT....66d...9A. doi:10.1063/PT.3.1929. Biquard, Olivier (2005). AdS/CFT Correspondence: Einstein Metrics and Their Conformal Boundaries. European Mathematical Society. ISBN 978-3-03719-013-5. Brown, J. David; Henneaux, Marc (1986). "Central charges in the canonical realization of asymptotic symmetries: an example from three dimensional gravity". Communications in Mathematical Physics. 104 (2): 207–226. Bibcode:1986CMaPh.104..207B. doi:10.1007/BF01211590. Carlip, Steven (2003). Quantum Gravity in 2+1 Dimensions. Cambridge Monographs on Mathematical Physics. ISBN 978-0-521-54588-4. Castro, Alejandra; Maloney, Alexander; Strominger, Andrew (2010). "Hidden conformal symmetry of the Kerr black hole". Physical Review D. 82 (2). arXiv:1004.0996. Bibcode:2010PhRvD..82b4008C. doi:10.1103/PhysRevD.82.024008. Coussaert, Oliver; Henneaux, Marc; van Driel, Peter (1995). "The asymptotic dynamics of three-dimensional Einstein gravity with a negative cosmological constant". Classical and Quantum Gravity. 12 (12): 2961–2966. arXiv:gr-qc/9506019. Bibcode:1995CQGra..12.2961C. doi:10.1088/0264-9381/12/12/012. Cowen, Ron (2013). "Simulations back up theory that Universe is a hologram". Nature News & Comment. doi:10.1038/nature.2013.14328. Retrieved 21 December 2013. Deligne, Pierre; Etingof, Pavel; Freed, Daniel; Jeffery, Lisa; Kazhdan, David; Morgan, John; Morrison, David; Witten, Edward, eds. (1999). Quantum Fields and Strings: A Course for Mathematicians. American Mathematical Society. ISBN 978-0-8218-2014-8. Fefferman, Charles; Graham, Robin (1985). "Conformal invariants". Astérisque: 95–116. Fefferman, Charles; Graham, Robin (2011). The Ambient Metric. Princeton University Press. ISBN 978-1-4008-4058-8. Giombi, Simone; Yin, Xi (2010). "Higher spin gauge theory and holography: the three-point functions". Journal of High Energy Physics. 2010 (9): 1–80. arXiv:0912.3462. Bibcode:2010JHEP...09..115G. doi:10.1007/JHEP09(2010)115. Greene, Brian (2000). The Elegant Universe: Superstrings, Hidden Dimensions, and the Quest for the Ultimate Theory . Random House. ISBN 978-0-9650888-0-0. Gubser, Steven; Klebanov, Igor; Polyakov, Alexander (1998). "Gauge theory correlators from non-critical string theory". Physics Letters B. 428: 105–114. arXiv:hep-th/9802109. Bibcode:1998PhLB..428..105G. doi:10.1016/S0370-2693(98)00377-3. Guica, Monica; Hartman, Thomas; Song, Wei; Strominger, Andrew (2009). "The Kerr/CFT Correspondence". Physical Review D. 80 (12). arXiv:0809.4266. Bibcode:2009PhRvD..80l4008G. doi:10.1103/PhysRevD.80.124008. Hawking, Stephen (2005). "Information loss in black holes". Physical Review D. 72 (8). arXiv:hep-th/0507171. Bibcode:2005PhRvD..72h4013H. doi:10.1103/PhysRevD.72.084013. Klebanov, Igor; Maldacena, Juan (2009). "Solving Quantum Field Theories via Curved Spacetimes" (PDF). Physics Today. 62: 28–33. Bibcode:2009PhT....62a..28K. doi:10.1063/1.3074260. Archived from the original (PDF) on 2013-07-02. Klebanov, Igor; Polyakov, Alexander (2002). "The AdS dual of the critical O(N) vector model". Physics Letters B. 550 (3–4): 213–219. arXiv:hep-th/0210114. Bibcode:2002PhLB..550..213K. doi:10.1016/S0370-2693(02)02980-5. Maldacena, Juan (1998). "The Large N limit of superconformal field theories and supergravity". Advances in Theoretical and Mathematical Physics. 2: 231–252. arXiv:hep-th/9711200. Bibcode:1998AdTMP...2..231M. doi:10.1023/A:1026654312961. Maldacena, Juan (2005). "The Illusion of Gravity" (PDF). Scientific American. 293 (5): 56–63. Bibcode:2005SciAm.293e..56M. doi:10.1038/scientificamerican1105-56. PMID 16318027. Archived from the original (PDF) on 2013-11-10. Perlmutter, Saul (2003). "Supernovae, dark energy, and the accelerating universe". Physics Today. 56 (4): 53–62. Bibcode:2003PhT....56d..53P. CiteSeerX 10.1.1.77.7990. doi:10.1063/1.1580050. Polyakov, Alexander (2008). "From Quarks to Strings". arXiv:0812.0183 [hep-th]. Rangamani, Mukund (2009). "Gravity and Hydrodynamics: Lectures on the fluid-gravity correspondence". Classical and Quantum Gravity. 26 (22): 4003. arXiv:0905.4352. Bibcode:2009CQGra..26v4003R. doi:10.1088/0264-9381/26/22/224003. Strominger, Andrew (2001). "The dS/CFT correspondence". Journal of High Energy Physics. 2001 (10): 034. arXiv:hep-th/0106113. Bibcode:2001JHEP...10..034S. doi:10.1088/1126-6708/2001/10/034. Susskind, Leonard (1995). "The World as a Hologram". Journal of Mathematical Physics. 36 (11): 6377–6396. arXiv:hep-th/9409089. Bibcode:1995JMP....36.6377S. doi:10.1063/1.531249. 't Hooft, Gerard (1993). "Dimensional Reduction in Quantum Gravity". arXiv:gr-qc/9310026. Witten, Edward (1988). "2+1 dimensional gravity as an exactly soluble system". Nuclear Physics B. 311 (1): 46–78. Bibcode:1988NuPhB.311...46W. doi:10.1016/0550-3213(88)90143-5. Witten, Edward (1998). "Anti-de Sitter space and holography". Advances in Theoretical and Mathematical Physics. 2: 253–291. arXiv:hep-th/9802150. Bibcode:1998AdTMP...2..253W.